If you know me, you know I can’t resist a community cookbook with worn corners and jagged, broken plastic teeth holding the pages together. Bonus points if features “cursive typewriter” font. It was these things that talked my into purchasing the combination “Big Y” local supermarket chain and 4-H club cookbook from 1985 that included this recipe for Butterscotch Chocolate Chip Cookies. 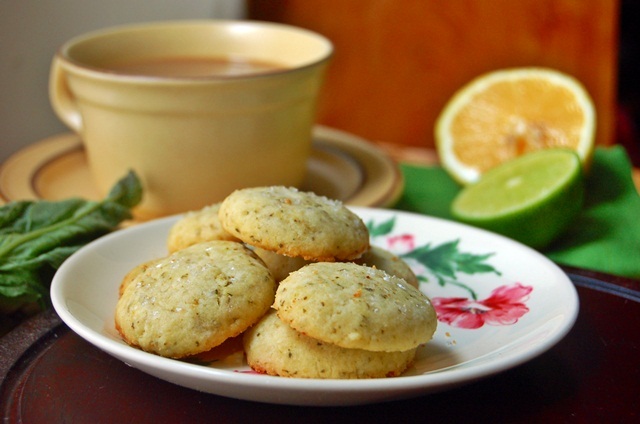 With a cake-like interior, glazed and sprinkled tops, and delicate licorice flavor, these easy Italian Soft Anise Cookies are a family favorite. 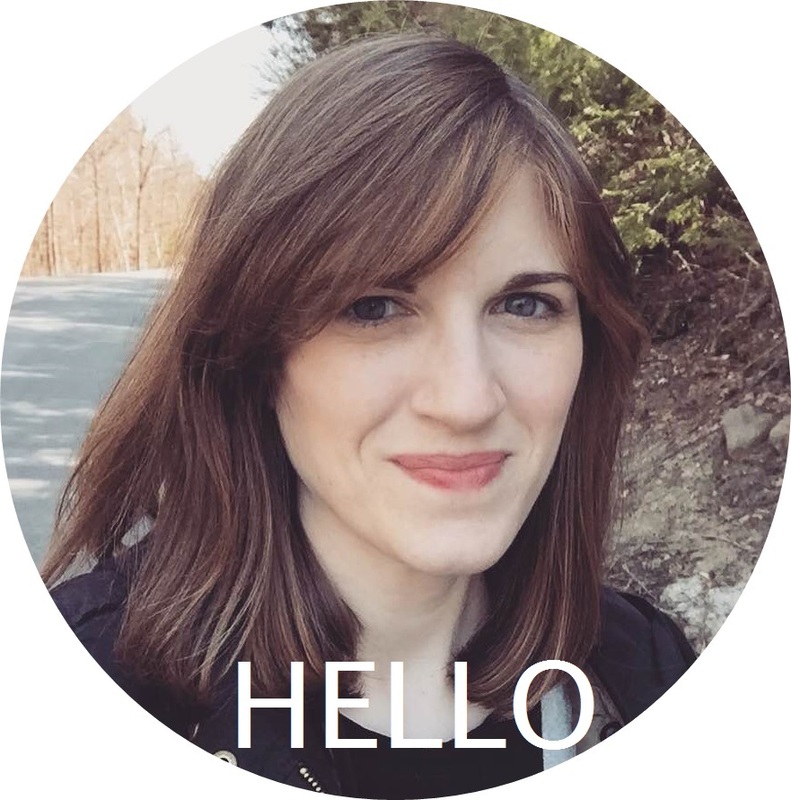 In truth, the foods I remember most were store-bought bagels, crisp and buttery from the toaster on tiny white paper plates, and any kind of macaroni — especially Mama Rosie’s cheese-stuffed ravioli with milk and garlic bread. The ravioli was frozen, but the 2-inch high mound of parmesan on top was always fresh, grated by hand from a wedge in the fridge. 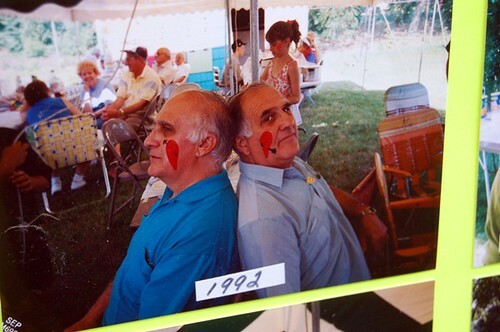 Uncle Artie on the right, posing with my Papa at our 1992 family picnic. Her cookies were firm and perfectly round, like mushrooms, but once bitten revealed a soft, cake-like interior. 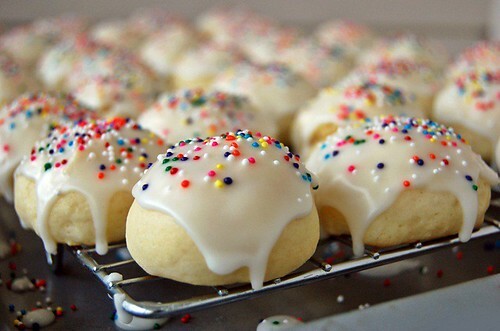 The tops were coated with a hard, shiny glaze and covered with minute, colored sprinkles. 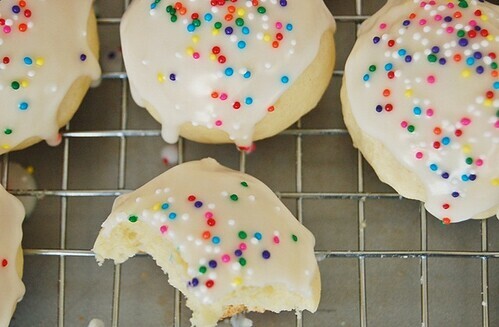 What child can resist the sight of all those sprinkles? I didn’t recognize the aroma or flavor, but it was not the vanilla, chocolate, or peanut butter cookies I was used to. If I had known the delicate, sweet taste in my mouth was anise (the flavor in black licorice) I might have stuck out my tongue and said I knew I didn’t like it, but I didn’t know, and they had those sprinkles, so I tried one. And I loved it. I’ve been dreaming of Auntie Mella’s cookies for years. She passed away before I developed my passion for baking, so I never had the chance to tell her how much I loved her cookies and how much they reminded me of being little and underfoot at family parties where all the people I loved were alive and happy and laughing and teasing one another after a baptism, or at our annual summer picnic. 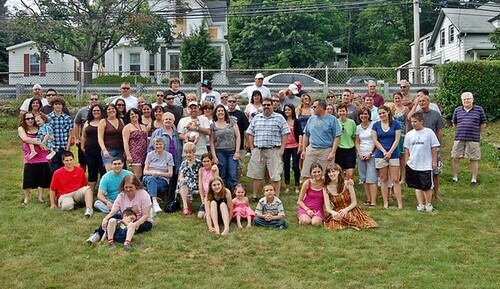 Our annual family summer picnic celebrated its 61st anniversary in 2011 – our last in Saugus. I tried to make them over the years. 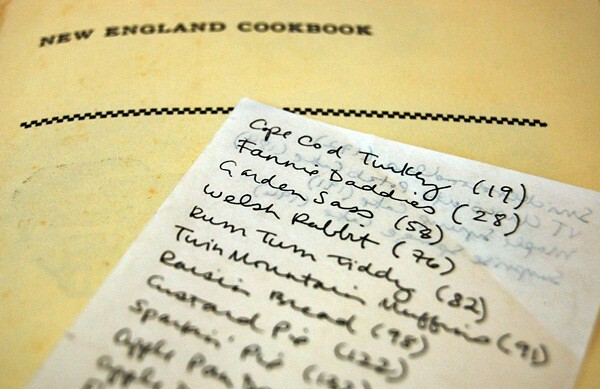 Tried to find recipes in tattered secondhand community cookbooks or online, my eyes scanning the list of ingredients and method of shaping and glazing, looking for something I recognized, but none of them ever looked or tasted right. None of them were Auntie Mella’s. Then, last weekend, I tried again. Unlike the other times, I updated my Facebook status with my plan, and a half hour later my mom called. She had the recipe I was looking for. Auntie Mella’s daughter, my mom’s cousin Anne Marie, had written it down for her on an envelope a few years ago at a family event. She knew it by heart. My mom read it out loud to me over the phone, and in about an hour, I was biting into one. An actual dream come true. Out of the oven they don’t look like much, but they smell wonderful, and it’s nothing a little glaze can’t help. They came out just as I remembered them. How often does that actually happen? I ate my fair share (never mind the number), then shared the rest with my friend Heather, mom, and Nana. 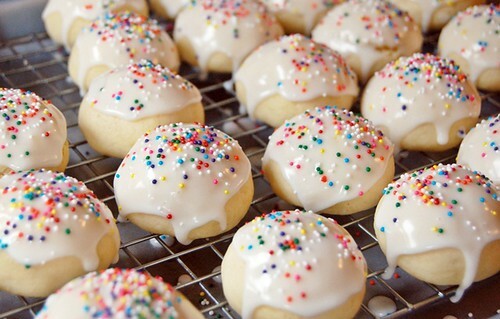 Food is arguably one of the strongest links we have to memory, so I plan on celebrating the memory of my Auntie Mella, the whole wonderful Italian side of my family, and my own childhood memories by making these cookies, and making them often. 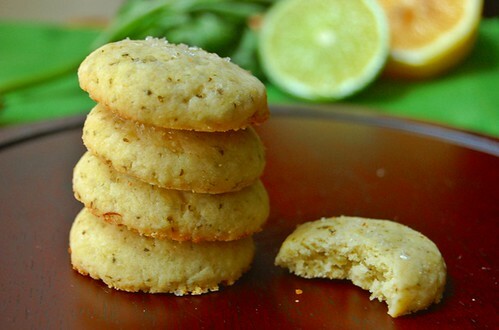 Try these soft anise cookies for yourself and see how delicious they are! In a large bowl, beat together the eggs, sugar, extract and baking powder. Add the vegetable oil and milk, then the flour, one cup at a time, until well combined. Chill the dough for 20 minutes to help with stickiness. Pinch off walnut-sized pieces of dough, and roll smooth between your palms. 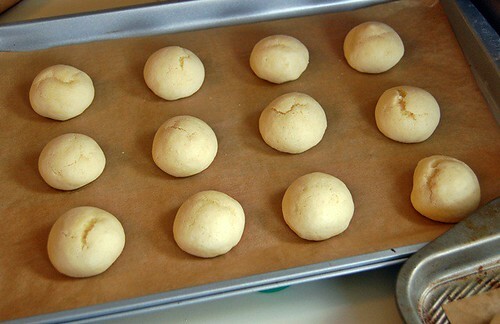 Arrange the balls of dough 2 inches apart on the baking sheets. Bake for 10-12 minutes, or until bottoms of the cookies are a light golden brown. The tops will still be pale. Remove from the oven, then transfer to a wire rack to cool. Combine the glaze ingredients in a bowl until just smooth. You want it more thick than thin, but still runny. Top with sprinkles before the glaze hardens. Cookies are best served they day they’re made. Once covered the trapped moisture will soften the glaze and the colors from the sprinkles will bleed. Still tasty, but not so pretty. 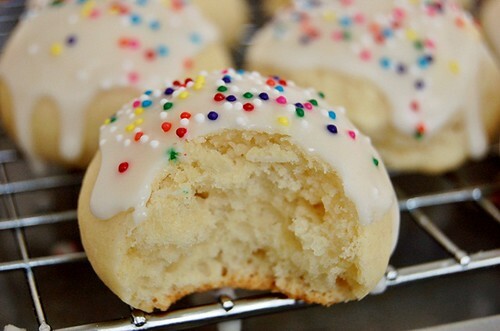 Click to view and print the recipe for Auntie Mella’s Italian Cookies. 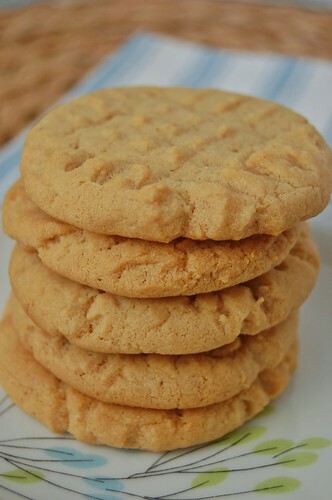 After the chocolate chip cookie, I don’t think any cookie in America is more beloved than the peanut butter cookie. Yes, I know there are versions of chocolate chip peanut butter cookies, and peanut butter cookies made even more peanut-y thanks to the addition of chunky peanut butter or chopped, salted peanuts…but for me, this classic version is still the best. 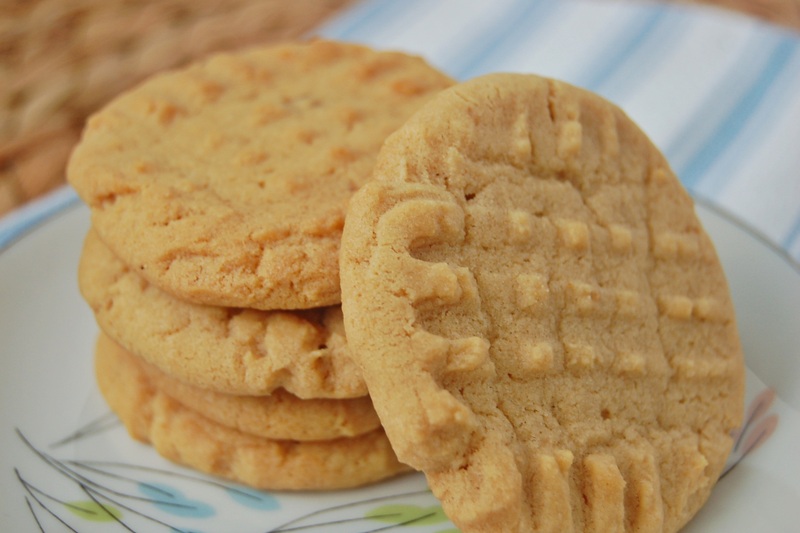 Ever wonder why peanut butter cookies have their distinct “criss-cross fork” pattern on top? 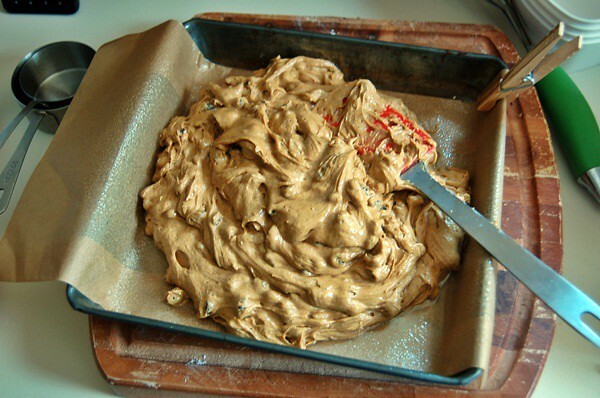 Peanut butter cookie dough is very dense, so pressing down on it before baking helps the cookie cook evenly. 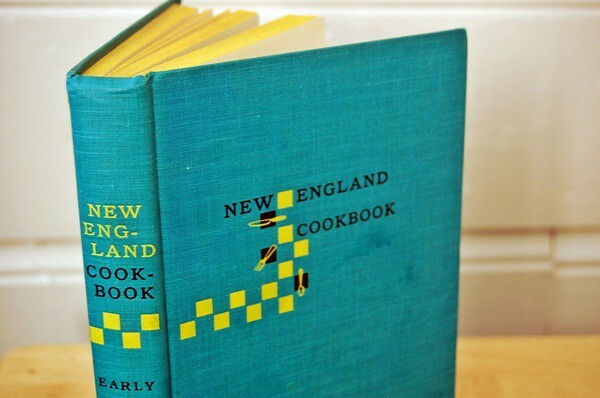 The earliest mention of the fork-press method dates back to the Schenectady Gazette in 1932, a trick quickly adapted and popularized by giant flour producer Pillsbury throughout the 1930’s, and the method stuck. When the craving for a good peanut butter cookie hits, whip up a batch (this King Arthur recipe is a winner), pour a glass of cold milk, and surrender. It’s an American tradition! In a separate bowl, combine shortening, sugars, egg, vanilla, and peanut butter until smooth. Slowly add the flour mixture to the peanut butter mixture until well combined. Add the water one tablespoon at a time until the dough comes together. 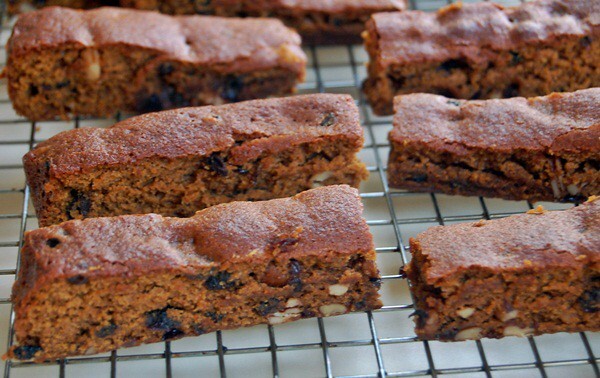 Place rounded tablespoons of dough onto the prepared baking sheets, leaving 2″ between each. Use a fork to press a criss-cross shape onto each tablespoon of dough. Bake for 12-14 minutes or until the edges are just beginning to brown. Do not overbake or your cookies will be too crisp. Transfer to a wire rack to cook, then store in an airtight container.